Most ghost images are made up of microscopic residues on the mesh left over from the previous job. These residues not only prevent the stencil from adhering properly, they can even affect the way in which the ink flows through the mesh to cause a latent ‘ghost’ image in the print. Therefore it is very important that these residues are removed from the mesh during the cleaning process. Before going into detail about haze removal it is worth stating that a few simple steps can be taken to reduce, or even eliminate, the formation of screen haze and stains. 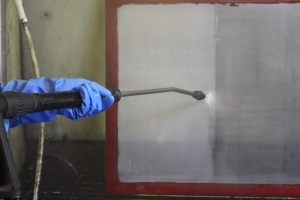 Exposing screens correctly, cleaning them as soon as possible after printing and using the right Screen Wash, can minimise and even eliminate the need for an additional haze removal process, saving time and money. Typically ghost images come from one or more of the following: fused Acetate (‘locked-in screens’) or Diazo from the stencil, ink that has dried-in, ink staining of the mesh fibres, or even mechanical abrasion of the mesh itself. Knowing the root cause of the stain will then help you choose the ideal haze remover to clean it. Diazo stains - Diazo sensitisers are chemical dyes and are, therefore, very effective at dyeing Polyester mesh. The yellow/brown stain left by Diazo can easily be removed by using a Sodium Hypochlorite based haze remover. If the Diazo stain is very noticeable, it is usually an indication that the stencil has been under-exposed. Fused Acetate stains - These are easily recognisable as a lightly coloured, translucent residue left on the screen where the stencil was. These stains can be removed using a Sodium Hypochlorite based haze remover activated with the recommended Screen Wash or ‘Activator’. Dried-in ink - If the ink has been allowed to dry in the mesh after printing it is very easy to see. Most inks can be re-dissolved using an appropriate and effective Screen Wash solvent, which makes removing them straightforward. Stubborn stains may require a more aggressive high caustic and solvent haze remover. Hardened ink - Two-pack catalysed inks are notoriously difficult to remove, as they are formulated to be highly resistant once they have hardened. You will need to use an aggressive very high caustic and solvent haze remover to have any chance of breaking these down. The longer the catalysed inks have been allowed to react the harder they will be to remove. UV cured inks - Screens that have been used for printing UV curing inks should not be left in a white light area as they will quickly harden and become much more difficult to remove. They will require either a Sodium Hypochlorite type haze remover with Screen Wash ‘Activator’ or a high caustic solvent haze remover, to eliminate them. Therefore, it is best to store these screens under yellow safelight (http://www.cps.eu/guide-detail/44_how-to-coat-cps-ultra-coat-emulsion--screen-printing-guide). Ink staining of the mesh fibres - Some inks will actually dye polyester thread during printing. If this does happen the stain can only be removed with a Sodium Hypochlorite type with Screen Wash ‘Activator’ or very strong caustic based haze remover. Although this type of stain does not reduce the mesh opening diameter it can cause problems during the exposure of subsequent stencils due to differential UV light absorption. All caustics react with aluminium, so take care when applying the low viscosity haze removers to aluminium frames and do not leave in an aluminium scoop coater overnight. ScreenprintingTopTip: A High Pressure Gun should be classed as an essential piece of screen making equipment as it will save you time, money and materials in cleaning screens. A good quality industrial High Pressure Gun producing at least 75 BAR will clean screens quicker and outlast the cheaper alternatives. It is always best to take a proactive approach to screen cleaning, to ensure that every screen is cleaned effectively before it is reused. Knowing the type of stains and the best way to treat them will help you remove them as quickly and efficiently as possible. The sight of a ghost image on your screen should not be ignored as this stain can, and probably will, cause you problems when that screen is next used, costing you time and money.